Dawn Claw Clip ~ Curls are always a pain to create, unless of course you have naturally curly hair. If so, then lucky you. For the majority of us with hair that doesn't like to cooperate with the curling iron we have the Dawn hairpiece for you. 12 inches of curls are layered down to your shoulders. Created with synthetic fibers, they are soft to the touch and very realistic in appearance. Blend the Dawn directly with your existing hairstyle with ease. We have the color that matches your own. Part of the Mona Lisa Collection, the Dawn uses a claw clip to attach. Within only seconds you could potentially change up your entire look with something fresh and new. 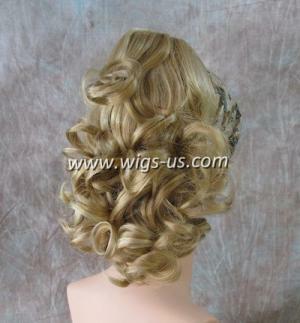 The hairpiece attaches for a secure fit that won't fall off when moving around. Style the Dawn two your liking, and be on your way in no time. At the lowest price possible, the Dawn makes for a great choice to own and wear starting today.